In response to the cyclist ticket outrage at UGA last fall, BikeAthens worked with several community partners to find a solution for effective bike travel through the heart of campus. Board member Jason Perry, our UGA Liaison, worked with Jimmy Williamson of the UGA Police Department, Lara Mathes of the UGA Office of University Architects, and Kevin Kirsche of The UGA Office of Sustainability to detail the reasons for the increased distribution of tickets and figure out possible solutions. Several board members contributed ideas and worked with Josh Koons of Koons Environmental Design. 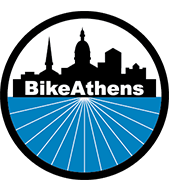 With the input of hundreds of BikeAthens, UGA, and community members, Koons Environmental Design developed the UGA Bicycle Facility Study recommending a contra-flow bike lane for Sanford Drive. Soon after, UGA implemented the suggested design changes for the intersection of Sanford Drive and Baldwin Street. UGA installed the new bike lane over the 2011-2012 winter break, and so far it is working wonderfully! Thank you for all of your input in helping us win a victory for bike and pedestrian safety and infrastructure! In conjunction with The UGA Office of Sustainability, BikeAthens will be leading a ride to showcase the new Sanford Bike Lane along with several proposed bike facility changes in February.